Galle is one of the gems of Sri Lanka, with its tree lined streets, old colonial buildings and rich history. It reminded us of Luang Prabang in Laos and Hoi An in Vietnam. If you visit this South Asian nation make sure to spend at least a day in Galle Sri Lanka. 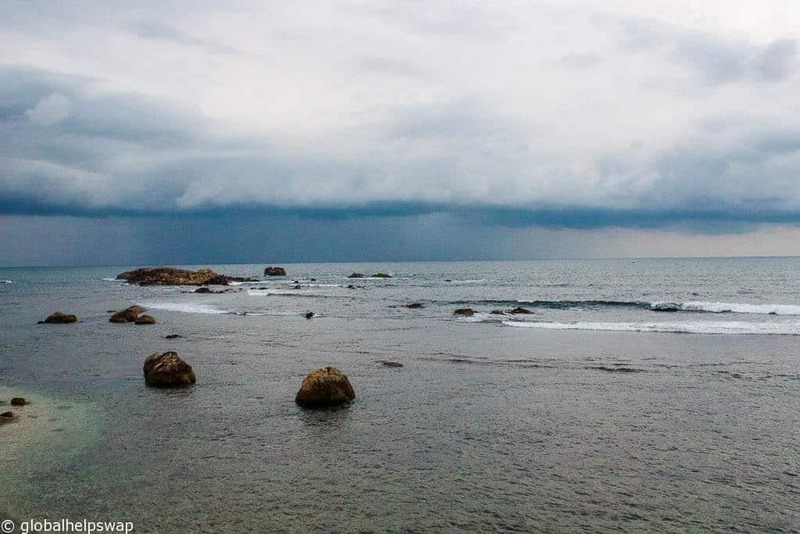 The average temperature in Galle is around 27℃ to 30℃ all year round. However since this is a tropical climate you should expect showers from time to time especially between May and September. The best time to visit Galle is between December to April as the weather is hot and dry, getting cooler towards March and April. Galle’s recent history includes stints by the Portuguese, Dutch and British but the area’s history stretches a lot further than colonial times. Persians, Arabs, Greeks, Romans, Malays, Indians and Chinese were trading with Galle long before the Portuguese turned up. 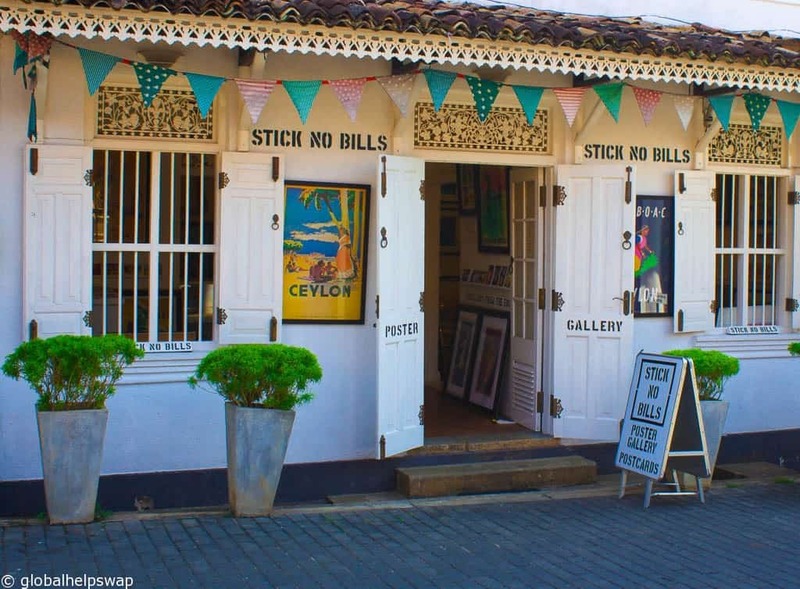 Modern Galle is full of boutique hotels, cafes, shops and galleries owned by artists, writers, designers and photographers which gives the place a bohemian atmosphere. But Galle is not just a living museum. It is still a working city with local life rushing around like anywhere else. Leave the tranquility of the fort area and you are quickly met with the chaos, smells and buzz of your typical Asian city. Start in the new town and visit the Dutch Market which is on the main street next to the Bodhi Temple. It has gorgeous displays of fresh fruit and vegetables under all shielded by the sun by a 300 hundred year old roof. Hunt down some Rambutan or Mangosteen fruit both of which are delicious. Next to the Dutch market there are other places that sell food and spices which are interesting to browse around as well. The old railway cafe is right opposite the, yes you guessed it, old railway right across from the small canal. Before leaving the new town to head to Galle fort, visit the Old Railway cafe for some lovely warm banana cake and a good coffee. This is by far the star of the show in Galle. The Galle Fort area includes over 400 historic places such as churches, mosques, temples and old houses and government buildings. It is a real treat to walk around and enjoy the beautiful architecture and browse around the many artistic shops that are springing up. If you’d like a guided walk consider joining Juliet Coombe on her 90-minute walking tours around the area. This was a real highlight of our day in Galle. Locals and visitors walked along the walls overlooking the beautiful sea as the sun set in all its splendour. The weather is a little cooler at this time of the day and the sea breeze makes the stroll really pleasant. There are so many lovely restaurants in this area which makes really hard to choose our favourite so we’ve included a cheap, mid-range and expensive option as well as an ice-cream parlour which is a definite must try. Pedlar’s Inn Gelato – 61, Pedlar Street. Just went the sun stats getting a bit too much and your feet are aching, head to Pedlar’s Inn for fantastic ice-cream which you can eat in air-conditioned comfort upstairs. Perfecto! If you are planning to spend a few days in Galle and are looking for the best Galle Hotels to stay in make sure you check our post on our Top Hotels to stay in Galle. If you are planning to come to Galle from Colombo check out our post on the different options you can take to get to Galle from Colombo. If you are planning to travel from Kandy to Galle read our post on the different ways to get to Galle from Kandy here. If you are planning to travel to this pretty town, watch our perfect day in Galle video to get some inspiration. Have you been to Galle? What did you think of it? Please let us know in the box below. If you are heading to Sri Lanka then check out this great packing list before you go. Are you heading to Sri Lanka? Why not buy the guidebook before you go? the vibrant community of Galle, with its eclectic mix of cultures, historic sites, and lovely seaside setting, which we visited in 2010. I’m planning to go to Galle Fort for a day trip from Colombo. Planning to take an early morning bus from Maharagama and return at night. Would it be possible to check out the fort and then go to Jungle Beach on the same day, before returning to Colombo? Also how would I get from the Fort to Jungle Beach? Hey Mohamed, thanks for the comment. How are you getting back to Colombo? It would be a tight push. A tuk tuk would be your best best to get to Jungle beach. It would take around 20 / 30 mins from Galle. Thanks for the write-up on Galle. I am interested in visiting Galle together with some friends and just wondering how easy is it to get around the place? Do you have to make arrangement for your own transportation like renting or the hotel can easily get taxis, etc. for you? Thanks in advance! Perfect information and highlights of Galle, I am looking forward to my visit. Thank you so very much for sharing and safe travels! Thank you so much! We are glad that you enjoyed it.